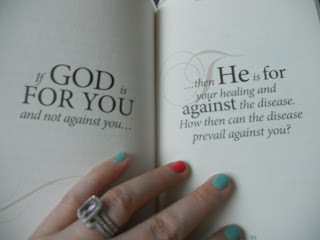 I found this while reading in mom's hospital room one day...very fitting and a good reminder for those days when you feel like your battle is too great. Your Abba dreamed up the very cosmos...nothing is too great for Him. Many people have been asking when mom will be going home for good. The answer is VERY SOON. The estimate is early November, but there are few things left to be done to wrap up her lengthy stay in Zion. 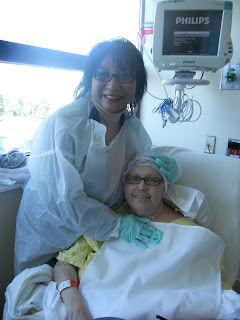 First, she has two more interthecals (where they shoot the chemo straight into the spinal cord) to do. She has already done two the past couple of weeks. A lot of people don't understand why she has to keep doing interthecals when she already did so many during her 8 rounds of chemo pre-transplant. Well, the idea is that with a nasty diagnosis like Philadelphia positive, adult ALL, recurrence could be high; HOWEVER, they (whoever "they" are) have discovered that after 8 rounds of "A" and "B" chemo (including interthecals each "B" side), a stem cell transplant, and 4 rounds of extra interthecals, the chances of recurrence reduce to something like 1%. PRETTY DARN AMAZING. So, while mom was not overjoyed to have to do these last four interthecals; she liked the odds in her favor if she agreed to them, so of course she did. Even though mom has been out-patient for a couple of weeks, she has still had to go in to stem cell clinic every day for CBC (complete blood counts), fluids, potassium, magnesium, and even some blood products a couple of times. It's quite common to need these things after stem cell transplant. When she gets home to Iowa, the plan is to have an organization come in daily to the house to help her with physical therapy (PT), clean, cook a bit, and do her CBC's and med support from the comfort of her recliner. It will be so nice to be HOME at last! She continues to do fairly well with her PT - going from not being able to walk at all to being able to walk fairly well with the aid of a walker but still needing some help getting up and down from sitting positions. This will continue to get better and better, and she will keep up her PT when she goes home to Iowa for an entire year, per doctor's orders. Her kidneys are functioning at around 40%; which is great considering she had complete kidney failure in July. Everyone is amazed at how much they have improved and continue to improve. We are believing for total restoration of kidney function. I know if God can save her from everything else that He has, He can restore her kidneys entirely too. But, the good news is they are functioning well enough that she will never need dialysis again - praise God! Now, we just have to get her to DRINK MORE water during the day; so her creatinine levels will stay down in the normal range! A few days ago mom had another bone marrow biopsy...I remember last November when they couldn't even get a good sample of her bone marrow, because it was so incredibly riddled with leukemia cells. Now, it's clean as a whistle; not one trace of cancer resides there. How amazing is that?! Her spinal fluid came back completely negative as well. God is so good to heal! The next day, I had a biopsy of my own...remember the stage 3C, cervical pre-cancer I had back in 2010? Well, yeah, it's STILL gone - woo hoo! I've been pre-cancer free for almost TWO WHOLE YEARS! I'm so blessed! Meanwhile, Mr. C and I are glad to have this month off and be back in Branson (home!). We have used this time to *nearly* finish Baby C's nursery, clean the house, sleep a LOT, take walks, be with our doggy who has stayed with Mr. C's mom and step-dad this whole time, and see people/go places we haven't laid eyes on in months and months. It's been glorious! Towards the end of this month, we will head back to Chicago/Zion to help move mom and everyone from the apartment in Waukegan back to my parents' house in Iowa. As glad as I will be to have this awful/amazing journey over with, it's going to be so incredibly strange to leave the CTCA. We've made so many friends, and it's really become the norm for Mr. C and I to be there every day. I can't imagine what it will be like to be "done" with it all. At the same time, I'm delighted. It's time. We're all weary and exhausted of hospital rooms and hospital food and protocols and doctors and just all of it. It's so hard to just "go back to real life"; but then again, that's the point of all of this, isn't it? To get healthy so you can go back to living your "real life". So hard to remember that when you're caught up in the midst of the every day fight. I know we will all forever be grateful to the doctors, nurses, PCT's, radiologists, assistants, culinary staff, janitorial staff, pastoral care, care managers, and so many, many more at the CTCA who made us feel welcome, comfortable, and like family along this journey. And to all those fighting along side us in the trenches - the other patients and family members - we will never forget you and are now friends for life. There is an unbreakable bond connecting those who have suffered so much together, and I know we are truly "family". Mom and Pastor Toi from religious care. She is a blessing - always so positive and full of God's word! Though this hasn't been the most fun journey that we've been on the past year, it's been a journey I will never take for granted. My mother has been healed and we have been shown the power and might of our Abba God - some people never get to see that in their whole lifetimes and only wonder if He is great and faithful and compassionate. We were shown all those things and more. BLESSED. I look forward to the day when I can shout that mom will be going HOME to Iowa for good. It's very soon, my friends...we're *almost* there! I can't wait to read your post about your mom's homecoming. :) So happy to read all this wonderful news!